If you’re looking for a simple and fun flower craft for kids, this is the project for you! We love this cute and easy flower craft for working on bilateral coordination and clothing fasteners (buttoning)! For kids who are just learning how to button (or who are struggling with getting the hang of clothing fasteners), this is a great way to practice and ease the challenge a little bit by using a button that isn’t sewn onto a piece of clothing. This makes it easier to manipulate. It makes a perfect Valentine’s Day or Mother’s Day gift and only requires simple materials that you probably already have on hand. The best part of this flower craft is that you can mix and match different colored felt, buttons, and pipe cleaners to make a one-of-a-kind final product! Loop a pipe cleaner through a button, twisting it to secure the button in place and leaving a length of the pipe cleaner for a stem. 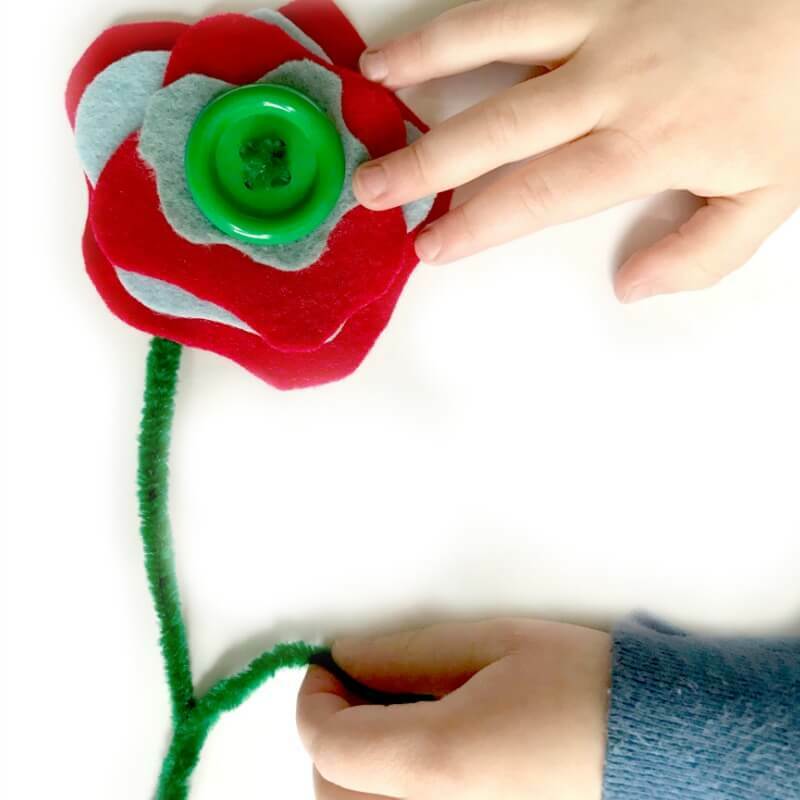 Give each child 3 or more of the felt pieces and demonstrate how to put them onto the flower by passing the button through the hole in the center of the flower shape. Button a few of the flower pieces in place to make the finished product! Bend some of the stem of the flower to make a leaf. -Use this activity to work on sequencing and to work on the concept of size. Provide instructions for the kids to put the flower shapes onto their button in the following order: the biggest flower goes on first, then the medium flower, and then the small flower. -For even more buttoning practice, have kids make a whole bouquet of these beauties! The perfect gift for a mom, grandma, or teacher! -Make it a matching game! Attach a several colored buttons to pipe cleaners of the same color. Cut several petals in colors that match the buttons/pipe cleaners. See if kids can match the petals to the same colored flowers! -Try making this flower craft and then following it with a fun flower picking/planting game! Poke several holes in the top of a cardboard box and “plant a garden” by sticking all of the kids’ flower stems through the holes. Let kids ride on scooters to pick flowers out of the box and then race across the floor to put them in a designated container until all of the flowers have been picked! Making this flower craft for Valentine’s Day? Check out one of our other favorite flowery Valentine’s Day Crafts for Kids! And try this Valentine’s Day Gross Motor Game or our Jumping Hearts Gross Motor Game! Making this flower craft for some springtime fun? 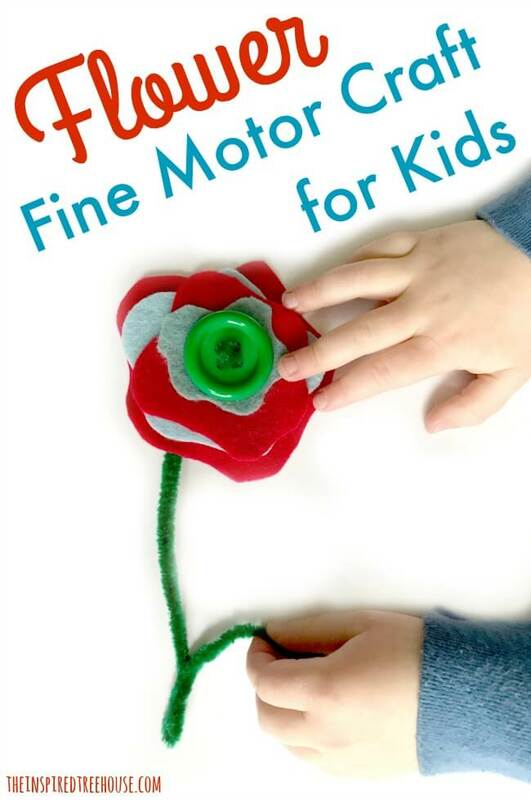 Try this Gross Motor Fun With Flowers! Or check out our FREE Printable Seed Collection pages! Our Spring Activity Pack is also great fun for the spring season! Using this project to work on clothing fasteners? Take a peek at our free printable, 10 Days to Conquer Clothing Fasteners! And learn more about working with kids on clothing fasteners here. I think we all should stop for a bit and consider the things that are said in this https://justbuyessay.com/blog/online-essay-writing-services article!